Febrile neutropenia (FN) is a common dose-limiting toxicity of chemotherapy, with a profound impact on the evolution of patients with cancer, due to the potential development of serious complications, mortality, delays, and decrease in treatment intensity. This article seeks to present an updated clinical guideline, with recommendations regarding the diagnosis, prevention, and treatment of febrile neutropenia in adults with solid tumors. The aspects covered include how to properly approach the risk of microbial resistances, epidemiological aspects, considerations about the initial empirical approach adapted to the risk, special situations, and prevention of complications. A decision-making algorithm is included for use in the emergency department based on a new, validated tool, the Clinical Index of Stable Febrile Neutropenia, which can be used in patients with solid tumors who appear stable in the initial phase of neutropenic infections, and can help detect those at high risk for complications in whom early discharge must be avoided. All of the authors have contributed equally to writing this manuscript. Febrile neutropenia (FN) is defined as the appearance of fever (temperature > 38 °C) or clinical signs of sepsis, in a patient with a neutrophil count of < 500/mm3 or < 1000/mm3 pre-nadir [1, 2]. It is a common iatrogenic complication, varying in incidence (2–50%), depending on patient-related risk factors, neoplasm, type of chemotherapy, and genetic susceptibility [3, 4, 5]. While most patients experience mild episodes, the rate of serious complications (25–30%) and mortality (9–12%) remains elevated in high-risk groups . The physiopathology of neutropenic sepsis covers the disruption of mucosal barriers, the architecture of the gastrointestinal lymphatic system, and the dissemination of bacterial inoculates throughout the bloodstream. Emergency (< 1 h) initiation of broad-spectrum antimicrobial therapy is indispensable to preserve clinical stability. In addition to its pharmacoeconomic impact [7, 8], neutropenia generates delays and dose reductions , which decreases the efficacy of chemotherapy [10, 11]. Primary prophylaxis of FN may be necessary for the most aggressive antineoplastic regimens or, in certain contexts, in subgroups of more vulnerable patients (e.g., the elderly) [12, 13]. The aim of this guideline, developed by the Spanish Society of Medical Oncology (SEOM, for its acronym in Spanish), is to set for the updated directives for the evidence-based diagnosis and treatment of FN in patients with solid tumors. These guidelines have been developed by SEOM with the consensus of a panel of ten experts in the management of immunocompromised patients with solid tumors. The assignment of a level of evidence and grade of recommendation for each statement follows the Infectious Diseases Society of America-US Public Health Service Grading System for Ranking Recommendations in Clinical Guidelines. A full list of recommendations for febrile neutropenia is provided in Table 1. In patients with solid tumors, FN has an identifiable clinical focus in 65% of the episodes; however, microbiological documentation is only possible in 20–30% of the cases and blood cultures are positive in 10–25% [14, 15]. Etiology is usually bacterial, due to both Gram-negative bacilli, as well as Gram-positive cocci (approximate ratio of 3:2). Selective pressures that favor Gram-positive cocci infections in hematological patients (central venous catheter [CVC], prophylaxis with quinolones, mucositis grade 3–4, etc.) are less intense in patients with solid cancer [15, 16]. Anaerobic microorganisms and polymicrobial infections are uncommon, but can occur in special situations (e.g., abscesses, enteritis, etc.). In recent years, there has been an increase in strains resistant to extended-spectrum β-lactamase (ESBL) or carbapenemases . The risk of resistant microorganisms depends on previous colonization, invasive procedures, prior exposure to antibiotics, prior hospitalization, chronic comorbidity, and local pattern of resistances [II] [18, 19, 20]. The pattern of resistance recorded in Spain in 2015 for Gram positive is 10–25% to macrolides, in the case of pneumococcus; 25–50% to cloxacillin, in the case of Staphylococcus aureus; up to 90% for coagulase-negative staphylococci, and 1–5% resistance to vancomycin in the case of Enterococcus faecium [I, A] . Invasive fungal infections (IFIs) are rare in patients with solid tumors (< 8%) . Risk factors for IFI include prior use of antibiotics, having received multiple lines of chemotherapy, high-dose steroids (doses equivalent to or exceeding 20 mg/day of prednisone for 4 weeks or more), extensive mucositis, CVC, and prolonged neutropenia (> 7 days). Candida albicans is responsible for most candidemias, with a recent increase in infections due to fluconazole-resistant species (e.g., Candida krusei and Candida glabrata). Seasonal respiratory viruses are common in contact with infected individuals, but reactivation of other latent viruses or relevant pathogens, common in the context of acute leukemia or bone marrow transplant, is unusual in the case of solid tumors [II, C]. The clinical history seeks to evaluate severity and clarify the clinical focus and epidemiological context (e.g., recent history of antibiotic use and the patient’s microbiological record). To identify the infectious focus, a systematic physical examination is essential, targeting potential foci of infection (CVC, skin, and soft tissues, perineal and perianal area, respiratory system, oral cavity, pharynx, sinus pressure points, abdominal examination; as well as neurological and eye fundus examination, if symptoms such as scotomas or blurry vision are present). Before administering empirical antibiotics, two sets of samples for blood cultures from different anatomic sites (if patient has CVC, at least, one of the samples should be taken through the catheter) and microbiological samples should be taken, depending on the clinical orientation (e.g., urine, sputum, mucosal or skin lesions, feces, cerebrospinal fluid, urinary antigens for pneumococcus and/or Legionella spp., nasal swab for flu virus during flu season, etc.) [III, A]. A complete blood count and biochemistry is necessary with liver and kidney function tests, lactate, and a chest X-ray with two projections [III, B]. Procalcitonin (value > 0.5 ng/ml) may be more accurate and earlier than C-reactive protein (value ≥ 90 mg/dl) to guide the diagnosis of bacteremia, and in predicting severity and FN complications, although its benefit is unclear with respect to the information provided by clinical criteria [II, B] . In patients with pulmonary infiltrates and more profound immunosuppression (e.g., steroids, prolonged neutropenia, use of immunosuppressants, etc. ), early bronchoscopy with bronchoalveolar lavage may be indicated. A full microbiological study (e.g., virus, fungi, atypical bacteria) is indicated in selected patients with clinical suspicion, previous infections or immunosuppression in addition to neutropenia [III, B]. In individuals with respiratory symptoms and inconclusive chest X-ray, or with persistent fever ≥ 72 h and risk factors for complications, a chest computed tomography is useful to detect incipient pneumonias, with 87% sensitivity and a negative predictive value of 88%, surpassing chest Rx  [II, B]. Abdominal Rx has low sensitivity and specificity, and an abdominal CT is preferable in clinically suggestive cases and suspicion of abdominal focus (enterocolitis, typhlitis, etc.). Severity is graded according to symptoms and signs, and risk assessment scores should only be applied when said signs and symptoms rule out clinical instability (see below) [III, B]. Most (3:1) individuals with FN and solid tumors display clinical stability in the first 3 h after diagnosis [25, 26]. High-risk patients or those who are potentially unstable are those with sepsis (defined as life-threatening acute organ dysfunction caused by the anomalous response to an infection, identifiable by an increase of 2 or more points on the quick SOFA scale),  septic shock, or severe documented infections (pneumonia, empyema, peritonitis, cellulitis > 4.5 cm, suspected typhlitis, enteritis grade 3–4, appendicitis, cholecystitis, or other complicated abdominal infections, meningitis, encephalitis, catheter infections, endocarditis, and pyelonephritis) [28, 29]. In these unstable patients, mortality due to sepsis is 18.1% versus 2.7% of patients without risk factors . Infections entailing greater mortality are chronic obstructive pulmonary disease (COPD) exacerbations, pneumonia, bacteremia (specially those caused by Gram-negative bacilli), and invasive fungal infections [6, 14]. Tumor progression and lung cancer are associated with a worse prognosis [6, 30, 31]. Furthermore, other toxicities (e.g., mucositis, enteritis, thrombopenia) or coexisting complications (thromboembolic disease, need for transfusion, etc.) affect decision-making [25, 26, 32]. Table 2 is a complete list of clinical characteristics that define an episode of FN as being high risk. Clinical assessment in subjects with inflammatory responses decreased by immunosuppression is complex, and some seemingly stable episodes remain at potential risk of complications, despite not showing evident criteria of severity at the onset of the FN episode. In three contemporary series, the frequency of unexpected serious complications in apparently stable individuals in the first 3 h was 7.3–18.6% [25, 29]. The Clinical Index of Stable Febrile Neutropenia (CISNE) (Table 2) was developed and validated for the Western population to predict serious complications (shock, acute organ failure, arrhythmia, major bleeding, delirium, disseminated intravascular coagulation, acute abdomen), in the subgroup of patients with solid tumors who have undergone mild–moderate-intensity chemotherapy and who appear to be clinically stable at the onset of the episodes [II, B] [14, 25, 26, 29]. Its application requires having previously ruled out hemodynamic instability or clinical risk of complications by means of vital signs, anamnesis, physical examination, and laboratory data (Table 3). CISNE should never be used in hematological patients or individuals with lymphoma, those who are unstable, with serious infections, or who have contraindications for ambulatory treatment for other reasons. There is no experience regarding its application to select patients at low risk for direct ambulatory treatment. Online calculators for CISNE are available and provide a categorized (https://www.mdcalc.com/clinical-index-stable-febrile-neutropenia-cisne) or continuous estimate of risk (http://www.iricom.es/prognostictools/cisne/inicio.aspx). 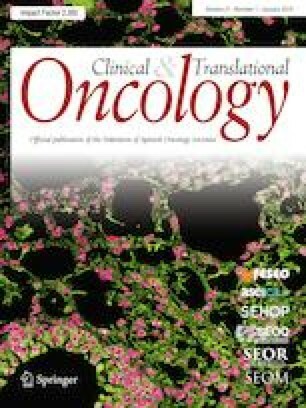 The usefulness of the Multinational Association of Supportive Care in Cancer (MASCC) is unknown in predicting complications in patients deemed stable and one must be cognizant of its methodological limitations (coincidence of hypotension as the main predictor and endpoint, heterogeneous population with hematological neoplasms, etc.) , and of its low sensitivity in stable patients (34.8–36%) [23, 24, 26, 31, 32, 33, 34]. Empirical treatment should be selected on the basis of the type and severity of the infection, and the probability of antibiotic-resistant microorganisms being involved in its etiology. The first dose of empirical antibiotic therapy should be initiated within the first hour and after taking samples for culture; hospitals should, therefore, adopt suitable logistical measures [II, A]. In the event that piperacillin–tazobactam is used, amikacin 15–20 mg/kg/day intravenous [IV] should be associated, or substitute the β-lactam for imipenem or meropenem due to the growing problem of Pseudomonas spp. infections, particularly in oncological patients, and ESBL-producing Gram-negative bacilli [II, A]. In situations of severity (e.g., quick SOFA ≥ 2 points), associate amikacin 15–20 mg/kg/day IV (higher doses may be appropriate depending on isolation and pharmacokinetic data) [II, A] to the β-lactam (preferably a carbapenem). When a catheter-related infection, skin focus, or pneumonia is suspected or if the patient presents hemodynamic instability, associate vancomycin (15–20 mg/kg/8–12 h IV), linezolid (of choice if the focus is pulmonary or cutaneous, but not recommended in catheter-related infections), or daptomycin (of choice in severe patients with quick SOFA ≥ 2 points and suspicion of cutaneous or catheter focus) to the β-lactam [II, A]. Tigecycline (50–100 mg/12 h IV after an initial dose of 100–200 mg) is an alternative that may be used as a last option given the increase in all-cause mortality observed in a meta-analysis. In case of enterocolitis (typhlitis) or perirrectal infection, the previously mentioned β-lactams are active; however, given the risk of possible resistance, the recommendation is that parenteral metronidazole 500 mg/6 h be associated [II, A]. In the event of prior carbapenem-resistant Pseudomonas aeruginosa colonization or of high risk due to high incidence of said strains in the patient’s setting and severity, assess the use of ceftolozane–tazobactam or ceftazidime–avibactam (unless resistance is already known) as β-lactam or associate colistimethate. In patients who are allergic to penicillin, the β-lactam must be substituted and aztreonam 1 g/8 h in association with vancomycin (or linezolid, tigecycline or daptomycin; see previous paragraph) used in its place, assessing the addition of metronidazole and/or amikacin, according to previous indications [II, B]. Consider the possibility that Pseudomonas aeruginosa may be resistant to aztreonam; therefore, in the previously mentioned situations it is wise to always associate amikacin, and later, with the data from the antibiogram in hand, assess the patient’s desensitization to the β-lactam of choice according to the microbiology data and focus of infection [II, B]. Amoxicillin–clavulanic 875/175 mg/8 h or 1000/62.5 mg 2 comp/12 h (per os) (clindamycin 300 mg/8 h in case of allergy to penicillin) + Levofloxacin 750 mg/day P.O. or ciprofloxacin 750 mg/12 h P.O. [II, B]. In patients who are allergic to β-lactams, there is no good oral treatment option. In these cases, the initial treatment should be intravenous; hospital discharge is not recommended until microbiological documentation is available or after 48–72 h of clinical stability. In our setting, in which enterobacteria resistant to quinolones and non-fermenting bacteria are high (up to 50%), initial treatment with fluoroquinolones in monotherapy is not recommended, not even in low-risk patients [II, D]. In general, antibiotic doses must be adjusted whenever necessary for the patient’s kidney function. Therapeutic use of granulocyte-colony stimulating factor (G-CSF) is recommended in episodes of FN in patients at high risk for infectious complications, with profound neutropenia (< 100 neutrophils/mm3), or in the presence of adverse prognostic factors, such as age > 65 years, unstable patients, with serious complications or widespread infections [I, A] [35, 36]. Their routine use is not recommended, since, although it decreases duration and hospital stay, it does not enhance survival [35, 36]. For infections due to certain resistant microorganisms or in special situations, there are specific recommendations to modify the general regimen, collected in Table 4. Samples should be taken for study by nucleic acid amplification techniques (NAATs) of the flu virus. Empirical treatment should be administered with oseltamivir 75 mg/12 h P.O. As regards fungal infections, empirical antifungal treatment must be initially considered (“preemptive therapy”) if, after 5–7 days of antibiotic treatment, the patient continues to be febrile and the initial microbiological studies are negative [I, A]; the most appropriate time depends on the clinical setting and the presence of risk factors for invasive fungal infection (IFI) (prolonged neutropenia, immunosuppressant treatment, corticosteroids, etc.). A galactomannan titer in blood of > 0.5 (optical density index) on two consecutive determinations, or > 0.7 in a single determination, is valuable for the diagnosis of invasive aspergillosis. Furthermore, the IFI must be characterized by means of targeted studies based on clinical suspicion (CT; ear, nose and throat exploration, lung puncture aspirate, biopsy of skin lesions, etc.) [III, A]. The choice of antifungal drug (echinocandin, voriconazole, or liposomal amphotericin B) is conditioned by the prior use of azoles, clinical suspicion, and results of the galactomannan test. Echinocandins would only be of choice in cases of suspected Candida spp. infection (patients with widespread mucositis, patients with CVC and/or parenteral nutrition); in the event that Aspergillus spp. infection is suspected (lung nodules, positive galactomannan test), voriconazole is the drug of choice . At centers with a high incidence of Mucorales, initiating liposomal amphotericin B treatment must be evaluated. Patients with FN are sometimes prescribed a diet low in bacteria, without having confirmed that this diet lowers the risk of infection or mortality [III, C] . Hand hygiene is the most effective procedure for preventing hospital acquired infections; all personnel should, therefore, follow hand-washing protocols before entering and after leaving the room of a neutropenic patient, as well as the “5 moments” approach of hand-washing as per the guidelines of the World Health Organization [I, A] . General protection measures should be adopted (e.g., gloves, gowns, and/or masks)  and the contact isolation measures established in each for specific isolations: methicillin-resistant Staphylococcus aureus, vancomycin-resistant Enterococcus spp, carbapenemase- or ESBL-producing Enterobacteriaceae, non-fermenting Gram-negative bacilli, such as Pseudomonas aeruginosa or Acinetobacter baumannii, with a pattern of multi-resistance [II, A]. Moreover, patients should optimize their oral and skin hygiene [II, A]. In patients with solid tumors, reverse isolation is indicated only for patients being treated with chemotherapy schedules that produce profound and prolonged neutropenia [II, A] . During follow-up of a patient with FN, a physical examination must be performed and their general daily status must be evaluated to rule out the appearance of new infectious foci. Vital signs must be taken every 8 h. Hemogram and biochemistry with daily kidney and liver function tests must be carried out, and blood cultures every 48 h in patients with persistent fever, in addition to sampling of other foci that may appear. Supervision, prevention, and treatment of other complications (thrombosis, anemia, thrombopenia, intestinal dysbacteriosis, mucositis, etc.) are needed [III, A]. The adjustments made to the antibiotic regimen will depend on the patient’s evolution, the infectious focus, and the sensitivity profile of the microbiological isolations. Likewise, if the fever persists and the focus of infection is identified, the antibiotherapy should be modified based on a specific suspicion or on the microbiological isolation [I, A]. In the case of having initiated specific empirical treatment against Gram-positive bacilli (e.g., glycopeptide), it must be withdrawn 48 h after its initiation if the initial suspicion is not confirmed [II, B]. In patients who have been febrile > 48 h without clinical worsening, a wait and see approach can be adopted, actively searching for the clinical source of infection by means of serial blood cultures, stool cultures, and imaging studies depending on the clinical suspicion. Similarly, peripheral venous catheters should also be rotated periodically and non-infectious causes of fever should also be assessed. In patients with persistent fever > 48 h who also present hemodynamic instability or clinical progression, the empirical antimicrobial spectrum should be expanded to cover resistant Gram-negative bacilli, Gram-positive bacteria, and anaerobes [I, A]. Antifungal medications may be necessary in patients who meet criteria of severity and have persistent fever > 4–7 days (see treatment in special situations, above). In cases that so require and depending on the patient’s options for recovery and the cancer’s prognosis, the intensive care unit will be contacted . The isolation of pathogens resistant to one or more of the components of the initial antibiotic therapy entails the need to adjust it (Table 4). A specialist in infectious disease or experienced clinician should be consulted when faced with patients with poor evolution, S. aureus bacteremia, persistent bacteremia, atypical microorganisms or resistances, highly severity infectious syndromes (CNS involvement, endocarditis, etc. ), the need for antimicrobials with which the attending oncologist is relatively unfamiliar (Table 3), or HIV infection [III, C]. Empirical antibiotic treatment should last for a minimum of 7 days in low-risk FN without an identified clinical or microbiological focal site. When the neutrophil count exceed 500 cells/mm3 and the patient has been fever free for 72 h, oral administration can commence (as per the same considerations as in the previous section) [III, A]. In FN with clinical or microbiologically documented infection, said treatment should be followed in accordance with the recommended duration for the underlying infectious process [III, B]. In the specific case of skin and soft tissue infections, pneumonias, and urinary tract infections, antibiotic treatment should be followed for 10–14 days in most cases [II, B]. In the event of microbiological documentation, the antibiotic spectrum can be decreased depending on the focus and severity of the infection, and the antibiogram of the microorganisms identified as the cause of the infectious disease [II, A]. Hospital treatment should be considered standard, whereas home treatment or early discharge is an alternative in selected, low-risk cases , defined as those that have no severity criteria [II, A] (Table 2). 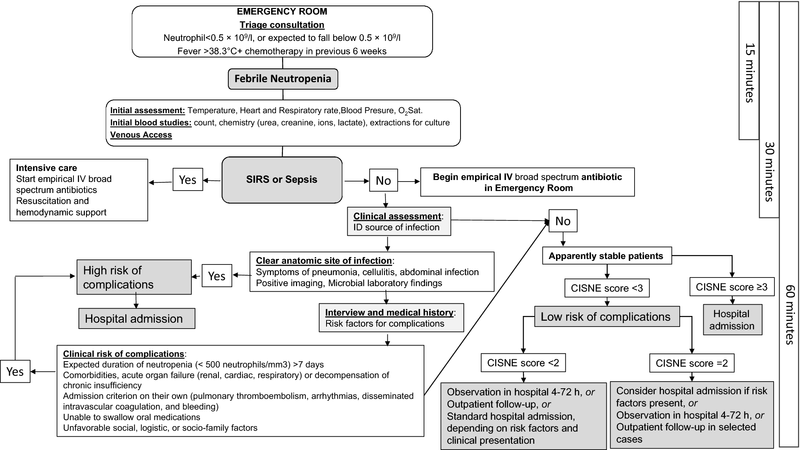 The CISNE model should only be used in patients in a situation of apparent clinical stability, after having ruled out clinical, epidemiological, or analytic criteria of severity, with the aim of avoiding early discharge of patients at potential risk for complications or severe sepsis. CISNE does not seek to select patients for outpatient management, but to safeguard them from inappropriate discharge until favorable evolution is confirmed. Figure 1 illustrates the decision-making algorithms that make up the CISNE score. In particular, stable patients who are qualified as high risk according to CISNE (score ≥ 3, its equivalent ≥ 116 points on the nomogram, or risk for complications ≥ 13% on the on-line calculator) should be treated in the hospital and should not be discharged until observation has demonstrated that the apparent stability is real and blood cultures have proven negative [II, B] [26, 29, 42]. In patients with a CISNE score of 2, additional clinical or microbiological risk factors should be considered that might also contradict ambulatory management. In patients who are at low risk (score CISNE 0–1), admission to hospital with early discharge, standard hospital admission or ambulatory treatment with close follow-up can be considered, depending on each episode’s clinical presentation [III, B]. In any case, given the potential risk of unexpected complications even in the lowest risk group (4.2% of the patients with 0–57 points on the CISNE nomogram) , for a patient with FN to be treated at home, all the following criteria must also be met: reside within 1 h or less than 50 km from the hospital; have a means of transportation available, access to a telephone, and good family support in the home for 24 h; have the approval of their referring oncologist/clinician; foresee good compliance with regular doctor’s visits; expected compliance with the oral administration of medications; and no prior history of non-compliance with treatment [III, B] . After being identified as low risk and initiating empirical antibiotic therapy and prior to discharge, patients must remain in observation for at least 4 h to verify their stability and tolerance to treatment [III, C] . If the decision is made to discharge the patient, close follow-up is mandatory with clinical reevaluation and hemogram 48 h later, and daily phone contact for a minimum of 3 days to check that the fever has resolved. It is important to properly inform the patient (orally and in writing) about the detection of warning signs and symptoms, as well as how to contact the healthcare personnel 24 h/day [III, B] [29, 32, 43]. Hospital admission must be contemplated when fever or neutropenia persists after 2–3 days of treatment with empirical antibiotic therapy, new signs or symptoms of infection, oral intolerance, or need to change antibiotherapy [III, B] . The risk of developing FN must be evaluated on a case-by-case basis at the beginning of each cycle of chemotherapy . Primary prophylaxis with G-CSF is recommended when the likelihood of developing FN is > 20% [2, 11, 45, 46], having demonstrated a decrease in incidence, duration, and severity, without significantly affecting tumor response or survival [I, A] [35, 47]. In patients with an intermediate level of risk (10–20%), the indication of prophylaxis with G-CSF must be individualized depending on the characteristics that increase the risk of FN (age > 65 years, liver or kidney dysfunction, widespread bone marrow involvement, recent extensive surgery, persistent neutropenia, or prior episodes of FN) [II, A] [2, 11, 45, 46]. In special circumstances, regardless of frequency, individuals may also be considered eligible for primary prophylaxis if the consequences of the neutropenic episode are foreseen to be more severe. The recommended dose of filgastrim is 5 µg/kg/day subcutaneously administered 24–72 h after administration of chemotherapy until achieving a sufficient, stable post-nadir neutrophil count [I, A]. Pegfilgastrim (a single dose of 100 µg/kg or 6 mg) can be more effective in different contexts and approved biosimilar drugs can also be considered [2, 45]. In patients who have experienced a prior episode of FN or dose-limiting neutropenia , the use of secondary prophylaxis with G-CSF can be considered individually if the dose reductions or delay of antineoplastic treatments can negatively affect prognosis [I, A] [2, 11, 45, 46]. In patients with solid tumors treated with chemotherapy of mild–moderate intensity, the use of prophylaxis with oral antibiotics to prevent episodes of FN [I, E] is not recommended, except for exceptional cases of patients with very high risk of infection in whom antineoplastic therapy cannot be delayed [III, B]. In patients with specific risks, prophylaxis against Pneumocystis jirovecii, tuberculosis , or viral hepatitis should be assessed according to recommendations found in other clinical practice guidelines [II, A]. Patients with active solid tumors and those receiving chemotherapy should be vaccinated every year against flu [II, A] and against pneumococcus [III, A] in accordance with guidelines for immunodepressed patients. Other vaccinations may be advisable depending on the kind of chemotherapy, the patient’s clinical status, or a specific indication . ACB have received speaker and travel grants from IPSEN, Servier, and Roche, outside the submitted work. PJF has nothing to disclose. EMC has nothing to disclose. EM has nothing to disclose. MB reports personal fees from Leo Pharma, Rovi and Sanofi, outside the submitted work. AC has nothing to disclose. JE reports personal fees from MSD, Novartis, Pfizer, BMS, Astra Zeneca and Roche, outside the submitted work. EGV has nothing to disclose. FH has nothing to disclose. FAP reports grants from Roche and Celgene, and other financial support from Roche, Celgene, Eisai, AstraZeneca, Pfizer, Pierre Fabre and Novartis, outside the submitted work. The current study has been performed in accordance with the ethical standards laid down in the 1964 Declaration of Helsinki and its later amendments. This article does not contain any studies with human participants or animals performed by any of the authors. Clinical Index of Febrile Neutropenia WebSite; 2015. http://www.iricom.es/prognostictools/Cisne/inicio.aspx. Accessed 15 Oct 2018.